Well friends, we've come to the last of the coral comparisons. I've done the Red Corals, Peachy-Pink Corals and now we'll take a look at all the Orange Corals. For some reason, this group especially screams summer to me! Let's take a look at all the formulas and how they apply. I acquired this polish because Austrian bought it for herself and hated it. I really love it but it does have a finicky formula. It dries fast and at three coats I can still see some streaking. I think a coat of Fill the Gap would've helped with that but I didn't use base coat, so I went for a 4th coat of polish. The more coats I added, the less it wanted to self-level so by 4 coats I had some ridges. I needed top coat to smooth everything out. 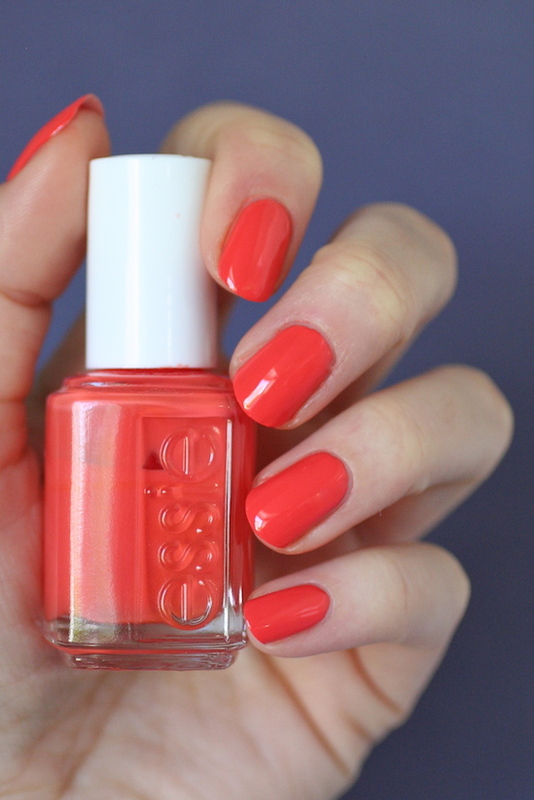 It may look like a coral polish in the bottle but once on the nail it's straight up orange. In the bottle Haute As Hello looks VERY similar to Resort Fling but as you can see in the collage up top, they are totally different. It's like a pastel neon orange. Despite the formula, I honestly love it so much. 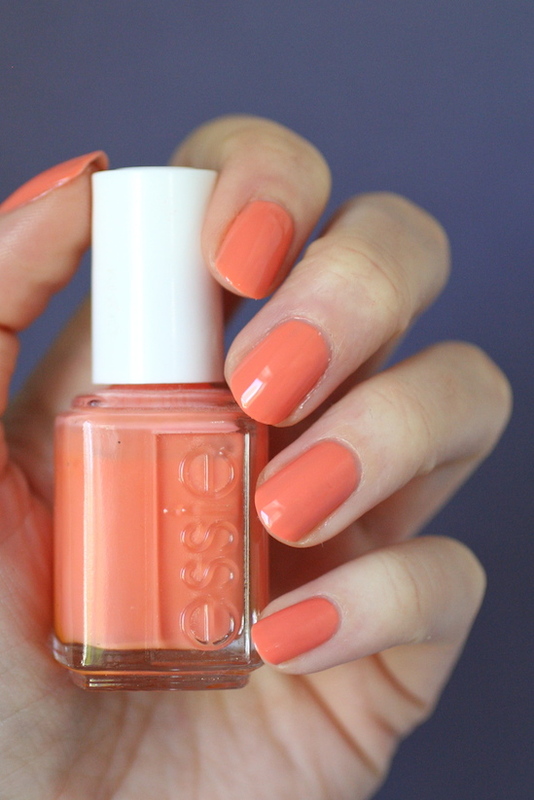 If I want to wear an orange polish, it's this one. If you hate finicky polishes, Haute as Hello is probably not for you, but it's a beautiful unique colour in my collection so I can deal with it. This polish came out in the Summer of 2010. It must've been added to the permanent collection because I've seen it on the shelves at my local Shopper's Drug Mart. You can probably also find it online. This polish is another 4 coater but I'm not in love with the colour so I've never liked this polish. Like from the moment I bought it I hated it. I'm coming around to it's dusty quality and I probably like it more now then I did 3 years ago, but because I don't love the colour, the fact that it's a 4 coater bugs me. It's a sheer jelly/crelly polish and at 3 coats you can still see your nail line. That would be fine if it wasn't so streaky but it is, so I always need the 4th coat to even everything out. The plus is that the formula isn't thick and is easy to apply. There's also no ridging and it self-levels nicely. I broke a nail yesterday so my nails are a tad shorter than they've been for the rest of the coral comparisons, but if they were still a bit longer I think my nail line would be more obviously visible. Depends if you like that look. This polish would work well as a jelly sandwich. Resort Fling was the namesake polish of the 2014 Resort Collection. It wasn't added to the permanent collection, so this is a polish you would have to track down online. 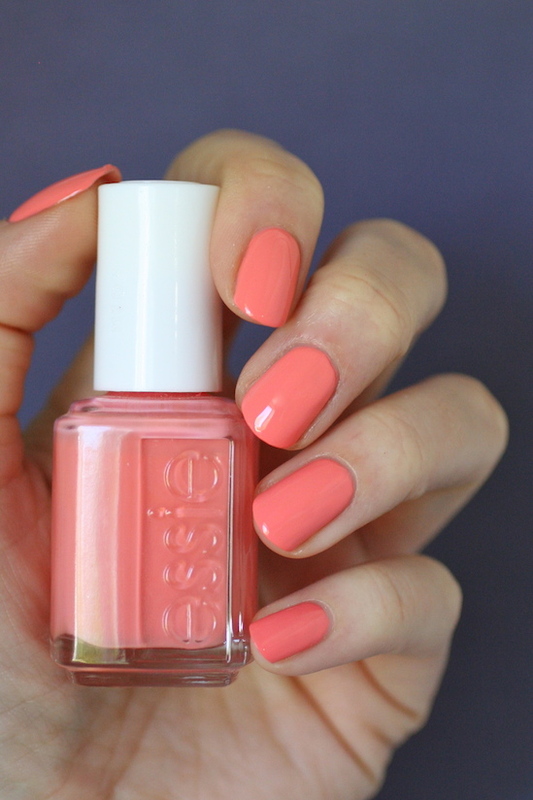 Peach Side Babe is a pretty peach with a bit of pink tones to it. It has a nice creamy formula. It was mostly opaque in 2 coats but I had a couple nails that needed a 3rd coat to smooth out the dark spots, but it was easy to apply. This polish came out Summer 2015 and was added to the permanent collection. I found it here on Amazon. 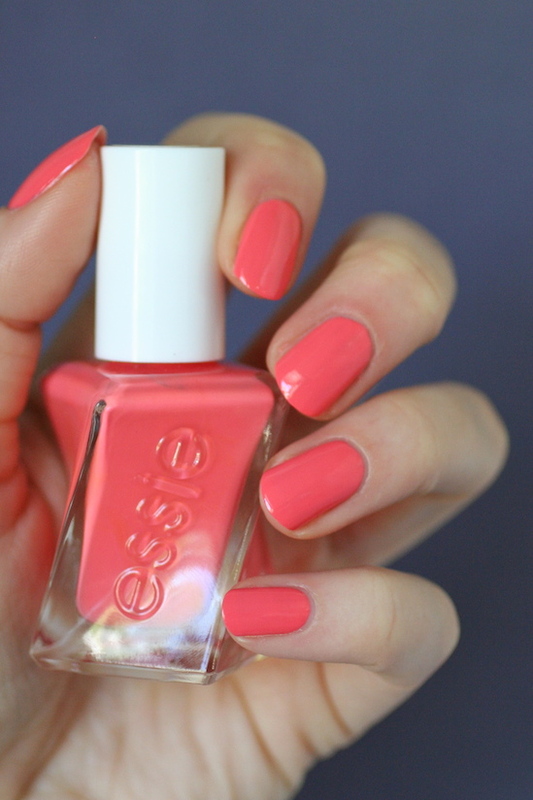 This is a cult-classic Essie coral. It's similar to Peach Side Babe but with less peach tones and more pink. It has a creamy formula. It's opaque, smooth and self-leveled in 2 coats. It came out in Spring 2010 - The Art of Spring Collection (along with Van D'Go, Neo Whimsical and Lilacism). It was added to the permanent collection and you could find this one anywhere. I found it here on Amazon. 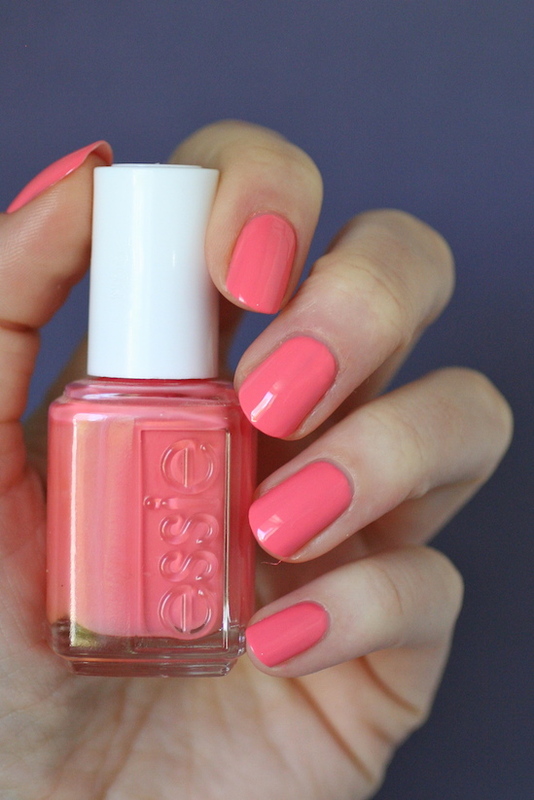 Lounge Lover leans even more pink than Tart Deco. It's nice and opaque and has a creamy, self-leveling formula. Opaque mostly in 2 coats (the odd nail may need that 3rd coat). It came out last year in the Spring 2016 Collection but I don't think it was added to the permanent collection. This one should still be pretty easy to find though, since it only came out a year ago. Either on clearance shelves at the the drugstore or online. I borrowed this one from my friend Bailey. It's both bright orange and bright pink at the same time, it's very pretty! It has a nice formula and is easy to apply in 2 coats. It also self-levels nicely. The wide gel couture brush also makes it easy to apply. This came out last summer in the core Gel Couture line and you could find it anywhere. I found it here on Amazon. This polish is the darkest orange out of all the ones here, but it still has those pinky coral undertones (you can see that more clearly HERE when it's up next to straight oranges). It has a really nice self-leveling formula. I must not have closed my bottle properly the last time I used this colour because it had thickened and become goopy and stringy (basically unusable). I added a ton of polish thinner and it still looked thick and ridgy when I applied it to my nail, but then it self-leveled! There's no top coat at all in this pic to smooth out the surface. When I had a brand new bottle, the formula was nice and smooth and easy to apply and was opaque almost in one coat. It came out in the Spring 2016 Collection along with Lounge Lover, but it wasn't added to the permanent collection either. 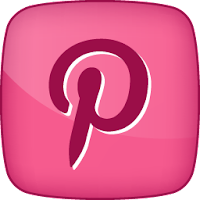 You should still be able to track it down online fairly easily though. I included Sunday Funday in the Red Coral comparison because it's so dark and saturated in colour, but it also has strong orange undertones so it needed to be here too. It's quite similar to On the List, just a touch darker/more saturated. It's a 3 coat crelly formula with fine silver shimmer. It was added to the permanent collection and I was able to find it here on Amazon. This polish was in the Peachy-Pink Comparison. It's so close in colour to On the List as well, it's just a bit more toned down. While On the List is bright this one has a dusty quality to it. It's opaque in 3 coats. It came out in 2003 so it might be a tough polish to find but my friend found it on sparklecanada.com. Haute As Hello is the lightest, brightest and most orange. 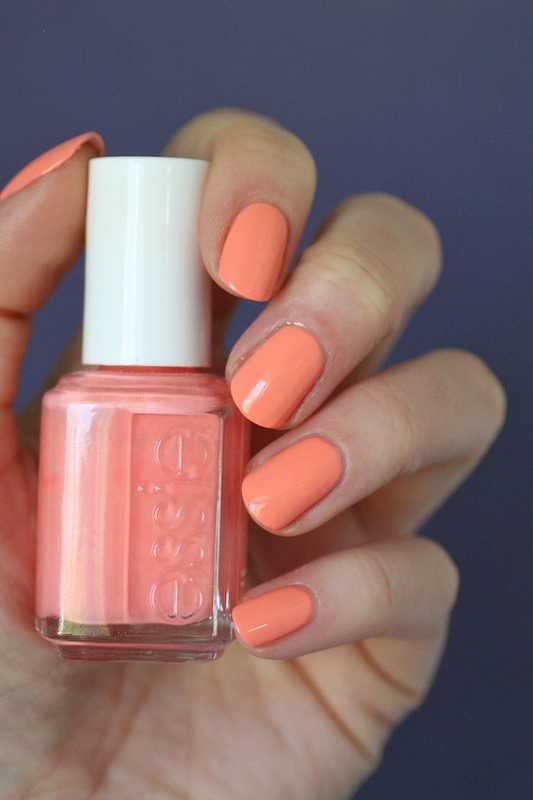 Resort Fling is quite on the orange side of coral as well, but also has a dusty, toned-down quality to it. Peach Side Babe is lighter and a bit peachier than Tart Deco. 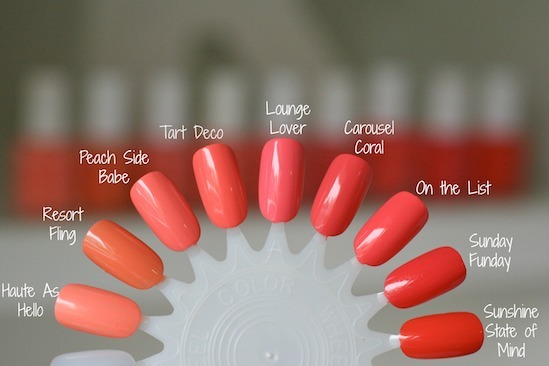 Tart Deco is a touch darker/more saturated in colour than Peach Side Babe (although they are quite close). 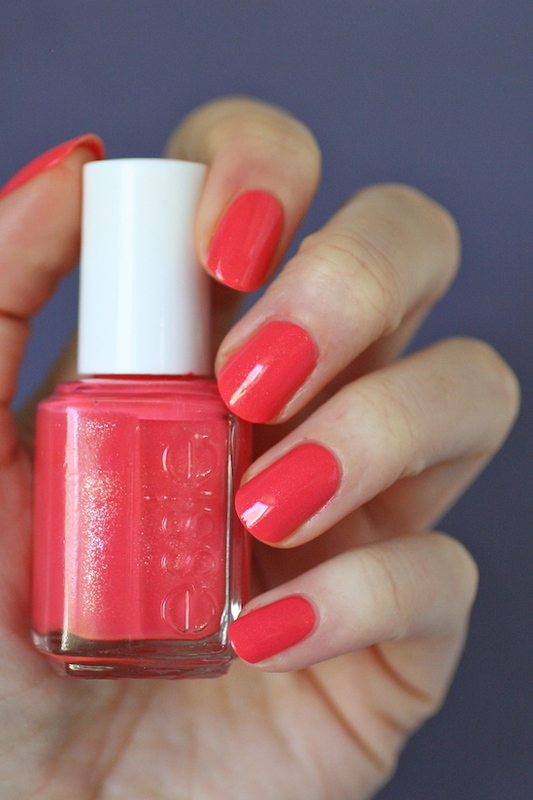 Lounge Lover is a pinker version of Tart Deco. Carousel Coral is very similar in colour to On the List but it has a dusty toned-down quality to it, and On the List is nice and bright. I would say it's most similar to Lounge Lover with a touch more orange instead of pink. 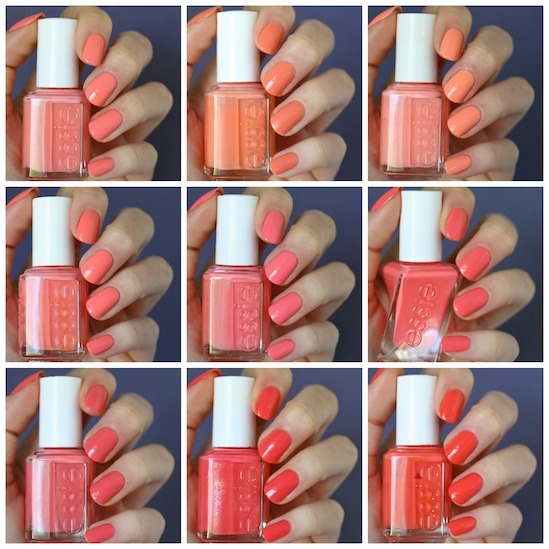 Sunday Funday is a darker more saturated coral with fine shimmer and Sunshine State of Mind is very orange. My very favourite out of all of these is Haute as Hello because of that colour! I know its not everyone's cup of tea to work with a tricky 4 coat formula, but I get past it because of the fun bleached neon orange colour. Peach Side Babe would be another fave because of it's peachy tone. All of these are so perfect for summer! Which one is your fave? Thank you so much for these fabulous reviews and comparisons! It is so easy to get caught up in the prettiness of a polish and spend money (that you shouldn't be spending!) on polishes that you ultimately should not have gotten. I am not too into peachy polish. I do love them but they are not that nice on my skin tone unfortunately. Of all these polishes, Tart Deco is the only one I have. However, every time I see Peach Side Babe, I have yearnings! And now I am liking that Haute As Hello! 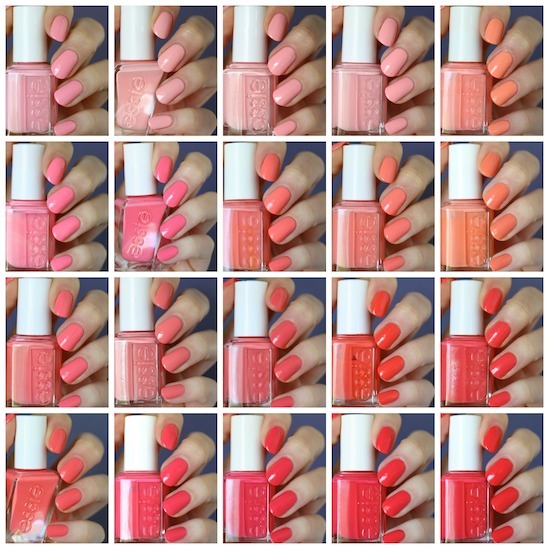 It always amazes me that Essie has so many polishes in a certain color range and there are usually not dupes. I am one of those people who go nuts over light turquoise / aqua polishes. My husband will look at my wall racks and wonder why I have so many of one color, lol. I keep trying to destash and eliminate dupes, but every time I do paper swatches of a similar range, I hardly ever get dupes. And I love them all!!! This coral comparison series has been my favorite! I have many corals, but found a few more I think I need to add to my collection haha! Ahhh, Sunshine State of Mind was one of my FAVORITE colors last year and I'm tempted to wear with for National Nail Polish Day! I loved it so much and I really hope my bottle still holds up! I wish they'd add it to their permanent collection! 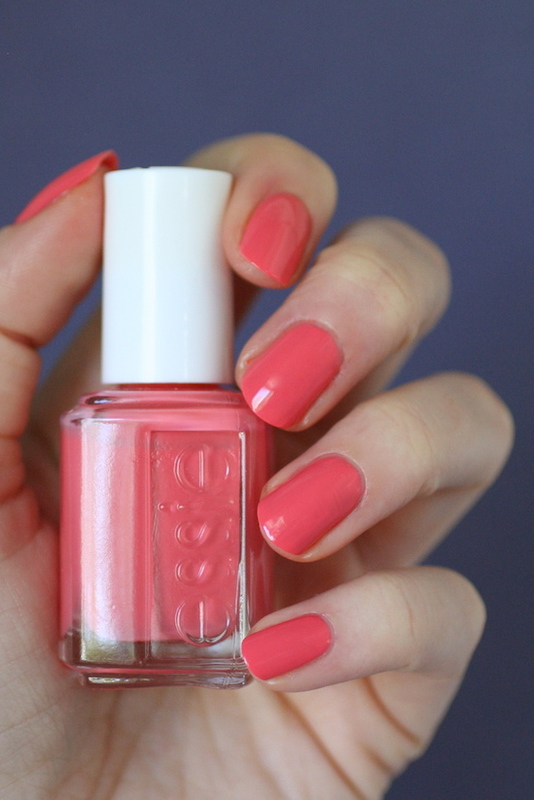 Tart Deco was one of my first Essie polishes, but since I already own it, I was thinking of not re-purchasing it but I went ahead and bought another bottle since it's an older bottle and stuck in London while I'm in Phoenix. I'll be wearing that one soon! Peach Side Babe is another favorite when I first discovered it in Target. Makes your skin look so tan! I didn't pick up Lounge Lover, but your post makes me wish I'd gotten it! Thanks so much LaraLeaf! I've come to the point where I just won't destash anymore. I get rid of stuff I don't like and then inevitably a couple years later I like and want that color back. I've succumbed to the fact that I'm an Essie collector and I'm okay with it 😜. And I totally know what you mean about these corals! Some of them look great on my skin tone and others just do not. I've mostly figured out if they are more pink tones I like them or strong leaning orange tone (like Haute as Hello). The stuff that's right in between wasn't my fave. So glad you liked it rccalyn! Which ones caught your eye that you think you'll add to your collection? 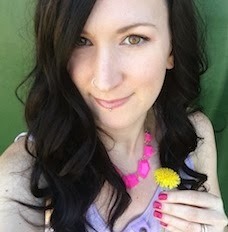 Jennifer Tart Deco was my first Essie too! I can see On the List looking so great on you. So perfect for summer. Nice! I’d add Stones n Roses and Let it Glow, although both lean more to the coral side than the peach. I have a Let it Go pedi and a Stones n Roses mani and they look lovely together. May try a LiG accent nail on the refresh.